The Altstadt von Bern is a unique beauty in the city of Bern. The old town makes for a fantastic leisure stroll downhill to the riverside. In the town you will come across magnificent old buildings with commendable architectural designs. The cathedrals in the old town are very attractive and well maintained while the parliament building is something you cannot afford to miss. If walking down to the town space is not you're kind of thing, take the tram to enjoy and explore the area. Be careful of the tram that passes very close to the pedestrian path. Take the tram on the way up as the climb will seem to be strenuous after a fun day. Love this? Explore the entire list of places to visit in Bern before you plan your trip. Fancy a good night's sleep after a tiring day? 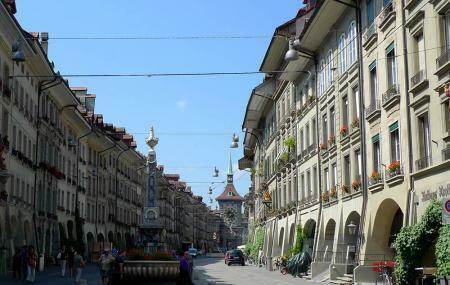 Check out where to stay in Bern and book an accommodation of your choice. How popular is Old Town Bern? People normally club together Kunstmuseum and Zytglogge while planning their visit to Old Town Bern. Be careful of the metros going around. So many shops in the area and nice ambience . Great city to visit, super walkable. Be sure to see the bears. Was there in Oct. was a bit chilly of course. But most of the old town has covered side walks to keep you out of the elements. A must see in Switzerland. Best place in Europe. Beautiful old city that's still intact. The arcades are great when it's raining. It's super walkable. The shops are nice. It's on a hill so once you walk down from the train station, it isn't so fun walking back up, but the trams are around regularly. At the bottom of the city is the bear park.